Set-top boxes? Built-in software on your TV? That’s so 2011. For 2012, media center manufacturer Roku is taking a different approach: The company on Wednesday announced that it would be compressing its traditional set-top software into a thumbdrive-sized Streaming Stick, to be available in the second half of 2012. 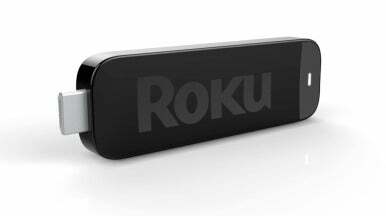 Designed for televisions with the new MHL (Mobile High-Definition Link) port, the Streaming Stick offers Roku’s full complement of software without the need for a bulky set-top box. Roku has partnered with TV manufacturer Insignia to bundle the Streaming Stick with the company’s new HDTV line, though the device will also be available as a standalone purchase. As the MHL port is still quite new, and not available on most televisions, the Streaming Stick won’t be shipping until later this year. Sounds intriguing, to be sure, but why go this route over built-in software or a set-top box? According to Roku, it’s all about space and upgradeability. Since the Streaming Stick connects directly to a television’s MHL port, it keeps you from having to add cables and boxes to your entertainment setup; additionally, if you purchase a MHL-compatible television with built-in software, and next year that software is rendered obsolete, you can still take advantage of all the technology the Streaming Stick has to offer, without having to upgrade your entire television. Of course, we’ll have to wait and see until later this year as to how that will shake out, and whether the majority of television manufacturers get on-board with the MHL standard. At the least, we should start seeing MHL-enabled TVs from Samsung, Sony, and Toshiba, as the companies are all part of the consortium trying to get MHL ratified as an industry standard. Roku has not disclosed any details on the price of the Streaming Stick, though the company’s current set-top boxes range from $50 to $100.